The NanoAerosol Generator (NAG) uses the same nebulizer design as the NanoParticle Nebulizer (NPN). However, unlike the NPN, the NAG has no on-line dilution capability’ any sample uses direct injection into the nebulizer allowing for a smaller, simpler and less expensive device. The sample to be nebulized is placed in a pressure vessel. When the vessel is pressurized to 18 psi the particle suspension is delivered to the nebulizer at the correct flow rate for direct injection. The pressure vessel can be replaced with a peristaltic pump that then delivers the sample to the nebulizer at the correct flow rate. The NAG has been designed for aerosol researchers who wish to produce droplets of a known, small, size distribution. The NAG aerosolized particle size of a 0001% sucrose solution is approximately 13 nm. Unlike electrospray, the NAG does not require a conducting liquid, can handle a very high percentage solids suspension and almost never clogs. Produces significantly smaller droplets than conventional nebulizers minimizing the influence of non-volatile residue. Aerosolizes primary particles with reduced potential for agglomerate artifacts. 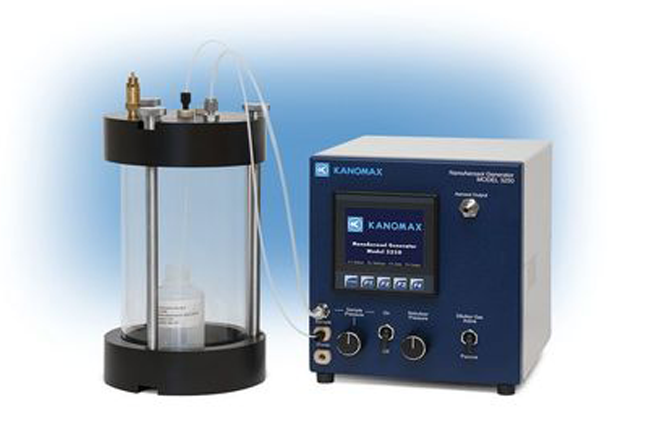 Uses pressurized sample delivery for high-purity and low-volume consumption. Eliminates the need for a separate desiccator by including an integral heater and dilution air to evaporate droplets and lower the dew point. Extends operation time with a highly stable output. Sample solvent does not evaporate over long-term operation maintaining a stable solution concentration and therefore a more stable generated particle size.